This article is about the English queen. For the Portuguese queen, see Philippa of Lancaster. Philippa of Hainault (Middle French: Philippe de Hainaut; 24 June c.1310/15 – 15 August 1369) was Queen of England as the wife of King Edward III. Edward promised in 1326 to marry her within the following two years. She was married to Edward, first by proxy, when Edward dispatched the Bishop of Coventry "to marry her in his name" in Valenciennes (second city in importance of the county of Hainaut) in October 1327. The marriage was celebrated formally in York Minster on 24 January 1328, some months after Edward's accession to the throne of England. In August 1328, he also fixed his wife's dower. Philippa acted as regent in 1346, when her husband was away from his kingdom, and she often accompanied him on his expeditions to Scotland, France, and Flanders. 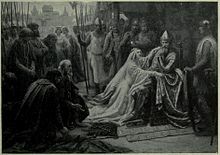 Philippa won much popularity with the English people for her kindness and compassion, which were demonstrated in 1347 when she successfully persuaded King Edward to spare the lives of the Burghers of Calais. This popularity helped maintain peace in England throughout Edward's long reign. The eldest of her thirteen children was Edward, the Black Prince, who became a renowned military leader. Philippa died at the age of fifty-six from an illness closely related to edema. The Queen's College, Oxford was founded in her honour. Philippa was born in Valenciennes in the County of Hainaut in the Low Countries, a daughter of William I, Count of Hainaut, and Joan of Valois, Countess of Hainaut, granddaughter of Philip III of France. She was one of eight children and the second of five daughters. Her eldest sister Margaret married the German king Louis IV in 1324; and in 1345, she succeeded their brother William II, Count of Hainaut, upon his death in battle. William's counties of Zealand and Holland as well as of the seigniory of Frieze were devolved to Margaret after agreement between Philippa and her sister. Edward III of England, however, in 1364–65, in the name of his wife Philippa, demanded the return of Hainaut and other inheritances which had been given over to the Dukes of Bavaria–Straubing. He was not successful, as it was the custom in these regions to favour male heirs. The lady whom we saw has not uncomely hair, betwixt blue-black and brown. Her head is clean-shaped; her forehead high and broad, and standing somewhat forward. Her face narrows between the eyes, and the lower part of her face is still more narrow and slender than her forehead. Her eyes are blackish-brown and deep. Her nose is fairly smooth and even, save that it is somewhat broad at the tip and also flattened, and yet it is no snub-nose. Her nostrils are also broad, her mouth fairly wide. Her lips somewhat full, and especially the lower lip. Her teeth which have fallen and grown again are white enough, but the rest are not so white. The lower teeth project a little beyond the upper; yet this is but little seen. Her ears and chin are comely enough. Her neck, shoulders, and all her body are well set and unmaimed; and nought is amiss so far as a man may see. Moreover, she is brown of skin all over, and much like her father; and in all things she is pleasant enough, as it seems to us. And the damsel will be of the age of nine years on St. John's day next to come, as her mother saith. She is neither too tall nor too short for such an age; she is of fair carriage, and well taught in all that becometh her rank, and highly esteemed and well beloved of her father and mother and of all her meinie, in so far as we could inquire and learn the truth. Four years later Philippa was betrothed to Prince Edward when, in the summer of 1326, Queen Isabella arrived at the Hainaut court seeking aid from Count William to depose King Edward. Prince Edward had accompanied his mother to Hainaut where she arranged the betrothal in exchange for assistance from the count. As the couple were second cousins, a Papal dispensation was required; and it was sent from Pope John XXII at Avignon in September 1327. Philippa and her retinue arrived in England in December 1327 escorted by her uncle, John of Hainaut. On 23 December she reached London where a "rousing reception was accorded her". Philippa married Edward at York Minster, on 24 January 1328, eleven months after his accession to the English throne; although, the de facto rulers of the kingdom were his mother, Queen Dowager Isabella and her avaricious lover Roger Mortimer, 1st Earl of March, who jointly acted as his regents. Soon after their marriage the couple retired to live at Woodstock Palace in Oxfordshire. Unlike many of her predecessors, Philippa did not alienate the English people by retaining her foreign retinue upon her marriage or by bringing large numbers of foreigners to the English court. As Isabella did not wish to relinquish her own status, Philippa's coronation was postponed for two years. She eventually was crowned queen on 4 March 1330 at Westminster Abbey when she was almost six months pregnant; and she gave birth to her first son, Edward, the following June. In October 1330, King Edward commenced his personal rule when he staged a coup and ordered the arrest of his mother and Mortimer. Shortly afterward, the latter was executed for treason, and Queen Dowager Isabella was sent to Castle Rising in Norfolk, where she spent a number of years under house arrest but with her privileges and freedom of movement later restored to her by her son. Joshua Barnes, a medieval writer, said "Queen Philippa was a very good and charming person who exceeded most ladies for sweetness of nature and virtuous disposition." Chronicler Jean Froissart described her as "The most gentle Queen, most liberal, and most courteous that ever was Queen in her days." Philippa accompanied Edward on his expeditions to Scotland, and the European continent in his early campaigns of the Hundred Years War where she won acclaim for her gentle nature and compassion. She is best remembered as the kind woman who, in 1347, persuaded her husband to spare the lives of the Burghers of Calais, whom he had planned to execute as an example to the townspeople following his successful siege of that city. She served as regent of England during the absence of her spouse in 1346. Facing a Scottish invasion, she gathered the English army and met the Scots in a successful battle near Neville's Cross: she rallied the English soldiers on horse before them prior to the battle, which resulted in an English victory and the Scottish king being taken prisoner. She influenced the king to take an interest in the nation's commercial expansion. Philippa was a patron of the chronicler Jean Froissart, and she owned several illuminated manuscripts, one of which currently is housed in the national library in Paris. Phillipa had given birth to thirteen children and outlived eight of them. Three of her children died of the Black Death in 1348. On 15 August 1369, Philippa died of an illness similar to edema in Windsor Castle. She was given a state funeral six months later on 9 January 1370 and was interred at Westminster Abbey. Her tomb was placed on the northeast side of the Chapel of Edward the Confessor and on the opposite side of her husband's grandparents Edward I and Eleanor of Castile and great grandfather Henry III. Her alabaster effigy was beautifully executed by sculptor Jean de Liège. Eight years later Edward III died and was buried next to Philippa. By all accounts, her forty-year marriage to Edward had been happy. Philippa and Edward had thirteen children, including five sons who lived into adulthood and the rivalry of whose numerous descendants would, in the fifteenth century, bring about the long-running and bloody dynastic wars known as the Wars of the Roses. Woodstock Palace, Oxfordshire 8 June 1376 Married his cousin Joan, Countess of Kent on 10 October 1361; Had issue (King Richard II of England). Woodstock Palace, Oxfordshire April 1379 or 17 June/5 October 1382 Married Enguerrand VII de Coucy, 1st Earl of Bedford on 27 July 1365; Had issue. Tower of London 1 July 1348 Was betrothed to Pedro of Castile but died of the plague en route to Castile before the marriage could take place. Pedro's two daughters from his union with María de Padilla would later marry Joan's younger brothers John and Edmund. Hatfield, South Yorkshire before 3 March 1337 Died shortly after birth. Buried at York Minster. Antwerp 7 October 1368 Married (1) Elizabeth de Burgh, 4th Countess of Ulster in 1352; Had issue. Married (2) Violante Visconti on 28 May 1368; No issue. Ghent 3 February 1399 Married (1) Blanche of Lancaster on 19 May 1359; Had issue (Henry IV of England). Married (2) Infanta Constance of Castile in 1371; Had issue. Married (3) Katherine Swynford (formerly his mistress) in 1396; Had issue. The Dukes of Beaufort continue in the male line today. Kings Langley, Hertfordshire 1 August 1402 Married (1) Infanta Isabella of Castile sister of Gaunt's second wife; Had issue. Married (2) Joan Holland (his 2nd cousin) in 1392. No issue. Died shortly after birth. Buried at Westminster Abbey. Bishop's Waltham, Hampshire September 1361 Married John IV, Duke of Brittany on 3 July 1361; No issue. Windsor 1 October/25 December 1361 Married John Hastings, 2nd Earl of Pembroke on 13 May 1359; No issue. Windsor before 5 Sep 1348 Died in infancy. Buried at Westminster Abbey. Woodstock Palace, Oxfordshire 8/9 September 1397 Married Eleanor de Bohun in 1376; Had issue. The Queen's College, Oxford is named after Philippa. It was founded in 1341 by one of her chaplains, Robert de Eglesfield, in her honour. Philippa is a character in The Accursed Kings, a series of French historical novels by Maurice Druon. She was portrayed by Françoise Burgi in the 1972 French miniseries adaptation of the series, and by Marie de Villepin in the 2005 adaptation. ^ Geoffroy G. Sury, Guillaume Ier (d'Avesnes) comte de Hainaut et sa fille Philippe, in " Bayern Straubing Hennegau : la Maison de Bavière en Hainaut, XIVe – XVe s. ", Edit. Geoffroy G. Sury, Bruxelles, 2010 (2e éd. ), p. 55 : – Un parchemin daté du 27 August 1326 à Mons, au sceau brisé, énonce qu'Edouard, duc de Guyenne (futur Edouard III roi d'Angleterre), fils aîné du roi Edouard (II) d'Angleterre, s'engage à prendre pour épouse, endéans les deux ans, Philippa, fille du comte Guillaume (Ier) de Hainaut, etc. In, G. Wymans, " Inventaire analytique du chartrier de la Trésorerie des comtes de Hainaut ", aux A. E. Mons, n° d'ordre (cote) 574, Editions A.G.R., Bruxelles, 1985, p. 128. ^ Sury Geoffroy G., "Guillaume Ier (d'Avesnes) comte de Hainaut et sa fille Philippe", in, Bayern Straubing Hennegau : la Maison de Bavière en Hainaut, XIVe – XVe s., Edit. Geoffroy G. Sury, Bruxelles, 2010 (2e éd. ), p. 55 : – Un parchemin daté du 30 August 1327 à Avignon, à un sceau, énonce que le pape Jean (XXII) accorde les dispenses nécessaires pour le mariage du roi Edouard (III) d'Angleterre et de Philippa, fille du comte Guillaume (Ier) de Hainaut, etc., sa parente au troisième degré. In, G. Wymans, " Inventaire analytique du chartrier de la Trésorerie des comtes de Hainaut ", aux A.E. Mons, n° d'ordre (cote) 583, Editions A.G.R., Bruxelles, 1985, p. 130.; – Un parchemin daté du 8/10/1327 à Nottingham, au sceau disparu, énonce qu'Edouard (III), roi d'Angleterre, donne procuration à R., évêque de Coventry, pour épouser en son nom, Philippa, fille du comte Guillaume (Ier) de Hainaut, etc., et régler la constitution de son douaire. In, G. Wymans, " Inventaire analytique du chartrier de la Trésorerie des comtes de Hainaut ", aux A.E. Mons, n° d'ordre (cote) 587, Editions A.G.R., Bruxelles, 1985, p. 131. ^ Un parchemin daté du 15 August 1328 à Northampton, au sceau disparu, énonce qu'Edouard (III), roi d'Angleterre, confirme la fixation du douaire de son épouse Philippa de Hainaut. In, G. Wymans, " Inventaire analytique du chartrier de la Trésorerie des comtes de Hainaut ", aux A.E. Mons, n° d'ordre (cote) 596, Editions A.G.R., Bruxelles, 1985, p. 132. ^ Leese, Thelma Anna, Blood royal: issue of the kings and queens of medieval England, 1066–1399, (Heritage Books Inc., 2007), 140. ^ Geoffroy G. Sury, Bayern Straubing Hennegau: la Maison de Bavière en Hainaut, XIVe – XVe s., Edit. Geoffroy G. Sury, Bruxelles, © 2010 (2e éd. ), p. 66 : – Un chirographe sur parchemin daté du 17 October 1346 à Ypres (Ieper), dont le sceau est détruit, énonce un accord conclu entre l’impératrice Marguerite II comtesse de Hainaut (épouse de Louis IV de Bavière, empereur germanique) etc., et sa sœur Philippe (Philippa de Hainaut), reine d’Angleterre (épouse du roi Edouard III) touchant la succession de leur défunt frère, Guillaume II comte de Hainaut, etc. Philippa, renonçant à ses prétentions sur le Hainaut, la Hollande, la Zélande et la Frise. In, G. Wymans, « Inventaire analytique du chartrier de la Trésorerie des comtes de Hainaut », aux A.E. Mons, n° d’ordre (cote) 869, Editions A.G.R., Bruxelles, 1985, p. 190.; – Un parchemin daté du 7/09/1346 à Francfort (Frankfurt am Main), dont le sceau est détruit, énonce que Louis IV de Bavière empereur du St.-Empire Romain Germanique s’engage pour lui-même et ses héritiers, et au nom de son épouse, l’impératrice Marguerite, à ne jamais céder, diviser ni engager les comtés de Hainaut, de Hollande, de Zélande et de la seigneurie de Frise, qui appartiennent à la dite Marguerite (Marguerite II (d’Avesnes) comtesse de Hainaut) et à ses héritiers, sauf les droits de ses sœurs, et, après le décès de cette dernière, à leur deuxième fils, Guillaume (futur Guillaume III comte de Hainaut) duc (I) de Bavière, et, celui-ci décédé, à Albert (futur Albert Ier comte de Hainaut), duc (I) de Bavière, leur troisième fils. In, G. Wymans, « Inventaire analytique du chartrier de la Trésorerie des comtes de Hainaut », aux A.E. Mons, n° d’ordre (cote) 868, Editions A.G.R., Bruxelles, 1985, p. 190. (Or. sur pch. ; dét. (Frankfurt am Main, 7/09/1346. ); – Un autre parchemin daté du 8/09/1346 à Geertruidenberg, d’après une traduction latine de l’allemand datée du 16 March 1347 (date nouv. st.), énonce que Marguerite II comtesse de Hainaut (épouse de Louis IV de Bavière, empereur germanique) etc., commet son fils Guillaume (futur Guillaume III comte de Hainaut) au gouvernement des comtés de Hainaut, de Hollande, de Zélande, et de la seigneurie de Frise durant son absence. In, G. Wymans, « Inventaire analytique du chartrier de la Trésorerie des comtes de Hainaut », aux A.E. Mons, n° d’ordre (cote) 868, Editions A.G.R., Bruxelles, 1985, p. 190. ^ Mortimer, Ian, The Perfect King: The Life of Edward III, Father of the English Nation, Vintage 2008, p.34. ^ "Philippa of Hainault". www.englishmonarchs.co.uk. Retrieved 26 December 2018. ^ Vale, Juliet (23 September 2010). "Philippa of Hainault". Dictionary of National Biography. Archived from the original on 2 June 2018. Retrieved 26 December 2018. ^ Boutell, Charles (1863). "A Manual of Heraldry, Historical and Popular". London: Winsor & Newton: 276. ^ a b Cawley, Charles. "Medieval Lands Project: Kings of England, 1066–1603". Foundation for Medieval Genealogy. Retrieved 4 January 2012. ^ Selby, Walford Dakin; Harwood, H. W. Forsyth; Murray, Keith W. (1895). The genealogist. London: George Bell & Sons. p. 228. Sury, Geoffroy G., Bayern Straubing Hennegau : la Maison de Bavière en Hainaut, XIVe – XVe s., (2nd Ed. ), Geoffroy G. Sury, Edit., Brussels, 2010. pp. 55, 66 & 128. Wikimedia Commons has media related to Philippa of Hainault.